I haven't had much time to fill this blog with useful info, so it seems I'll have to start with a presentation of my own research. A paper is up at arXiv [edit: and in Nanotechnology] describing what I believe to be a possible (though admittedly rather complicated) route to achieve very precise control over functional molecules in a scanning probe microscope. This has been inspired by discussions with Danila Medvedev and by reading the email discussion on scanning probe mechanosynthesis between Chris Phoenix and Philip Moriarty. In particular, the place where Moriarty mentions the use of carbon nanotube probes (which seems somewhat obvious in retrospect), and the place where Phoenix suggests imaging a known substrate feature to calibrate the relative position of the probe tips in space (which seems a serious complication: it should be better to use probes with well-known tip structure, e.g., carbon nanotubes). 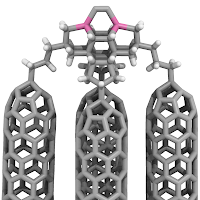 One of the problems with nanotubes is that, although the caps are normally more prone to chemical functionalization than the walls, you still don't know exactly where your functional group lands. 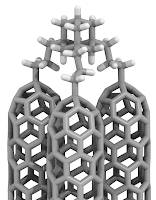 However, it appears that (6,0) nanotubes should have caps with a single site that is especially chemically vulnerable: a carbon atom belonging to three pentagons at the very tip. Therefore such a nanotube could be used as a very thin scanning probe with a well-defined funtionalization site known in advance. However, this would only work for very tiny functional groups, since larger molecules would rotate freely around the single covalent bond, destroying all the benefits of site-specific functionalization. 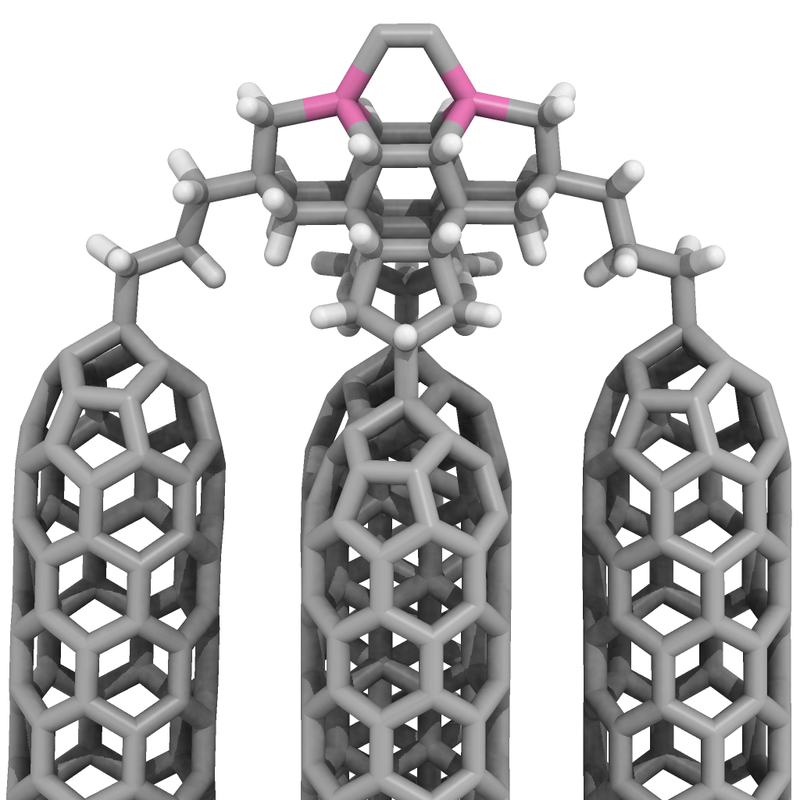 This problem could be solved by using a bundle of several nanotubes and attaching a larger molecule by at least three points. The figure shows an adamantane molecule supported in this manner (C3 alkane chains are used to fit the too-small molecule on top of the bundle). You can also see that if individual nanotubes could be actuated, this could be utilized to tilt the molecule; together with three translations of the manipulator and the axial rotation (either of the manipulator or of the substrate) this would amount to the six degrees of freedom claimed in the paper title. The rest of the paper is dedicated to explanations of exactly why I believe such a design (or a similar but much simpler which I haven't thought of yet) should be feasible with the technology that is either available presently or immediately accessible. Let's see if I can get this past the peer-review stage; in the meantime, everyone's comments and suggestions are most welcome! 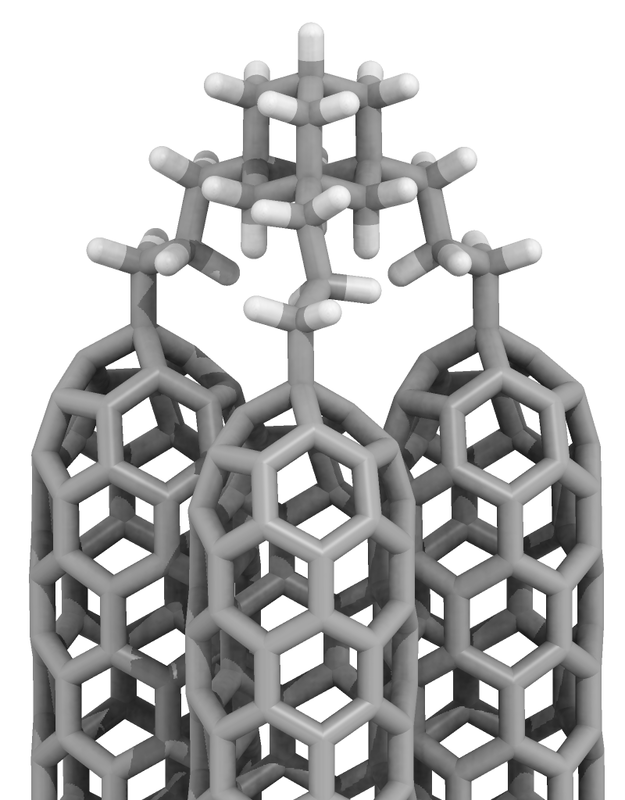 question from Ralph Merkle via Brian Wang - Nextbigfuture - Do you have a detailed description of the driving mechanism and the stiffness of the carbon nanotube bundles ?